As more and more comic book properties make their way to the big and small screen, they are simply going to have to make room for one crazy heroine. Insane Jane, based off the cult comic book from Bluewater/StormFront Productions is currently in development and has Joss Whedon’s Dollhouse alum Miracle Laurie attached as the eponymous Jane. The story of a deluded, yet-well-meaning heroine who believes she has super powers is being developed as a television series produced by Bohemia Group Originals and Miracle Laurie. Screenwriter Tracy Morse has also signed on for the project. The character made her debut in 2010 and added a unique take to the pantheon of superhero literature. She is described by original writer Zachary Hunchar: Take youthful energy. Add in some over-active imagination. Mix in some powdered donuts. Sprinkle it with delusional disorder and you get … Insane Jane! She’s the kookiest action hero of the 21st century. The production has not yet secured a distribution deal, but anticipates several suitors given the original concept and the high quality of the content. The production is set to go before the camera later this year. According to the producers, one of the challenges is featuring a character with severe schizophrenia. There are great opportunities to provide commentary on how we treat and perceive people battling mental health issues. Even though the material is often done tongue in cheek or for comedic effect, the central principle is that Jane, despite her challenges, is not the joke. StormFront Productions (formerly Bluewater Productions) also has film projects developing with Universal Studios and Paramount Picture and other studios for their titles Nanny & Hank, Legend of Isis, 10th Muse, and Sinbad Rogue of Mars. Bluewater Productions is probably best known for its references to popular culture, either through its biographical comics, its comics based on adaptations of somewhat obscure movies or television shows, or through its parody of other popular properties in comics or popular culture. Victoria’s Secret Service clearly falls into the latter category, even getting its name from the overly and extremely popular underwear company. Unlike the majority of Bluewater’s series, Victoria’s Secret Service is one which originated in the holdings of another comic company, the now defunct Alias Comics, and it represents some of the earlier work of the now-more established writer Terrance Griep. As is common with the passing of a team and a franchise from one company to another, an omnibus was produced which represents the most recent release of the somewhat obscure team. Other than seeing the series from time to time on the shelves and thinking that it was a clever play on words to circumvent any legal problems, I have never been exposed to anything to do with the team. 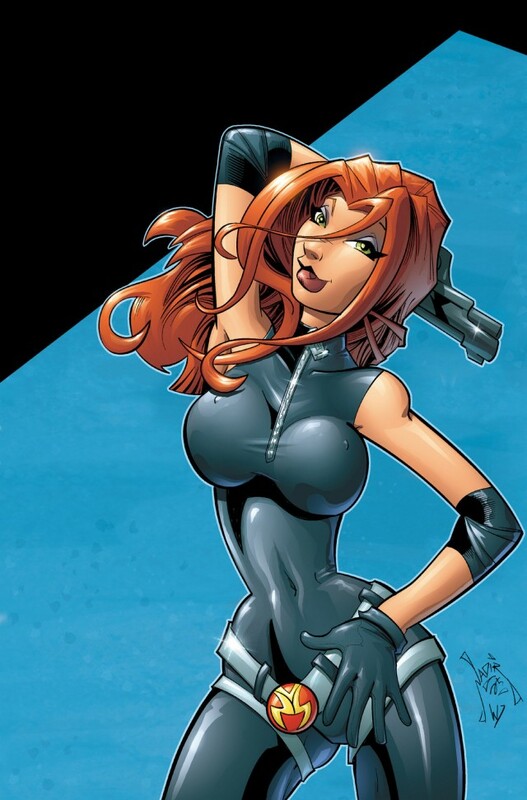 Clearly though in terms of its inspiration, the team draws heavily from Danger Girl, as a team of three, including one computer specialist that never sees the field, recruits an American thief to help them with an otherwise impossible mission. So too does the team borrow from G.I. Joe for their main bad guy, as Lord Mann is clearly influenced by Destro. Parody and paying homage to other popular culture properties is fine when done well, in fact it is what makes Danger Girl a continuingly appealing property after so long. The problem with Victoria’s Secret Service is that it doesn’t push those boundaries far enough. So while there are references to Victoria’s Secret, and homages to G.I. Joe and Danger Girl, this is never taken farther than some tongue-in-cheek humour. In the same vein, the series is at times clever enough. For instance, supervillain looking characters are introduced in some novel ways, such as when an otherwise normal person ends up looking like a supervillain as they go to a masquerade party. The sum of the experience is a bit of a mixed bag. It is not as though the reading experience was unpleasant, but it was sometimes groan-worthy for either the dialogue or the jokes, some of which bordered on being a bit too far in terms of their sensitivity. At the same time it was a fun experience in terms of the reading, at least in terms of the pacing and the action. Additionally, some of the plots and settings were fun as well, even if they weren’t necessarily groundbreaking. In the end I would say that I would recommend it to a fan of the Danger Girl franchise, especially those frustrated by the relatively slow pace of releases. 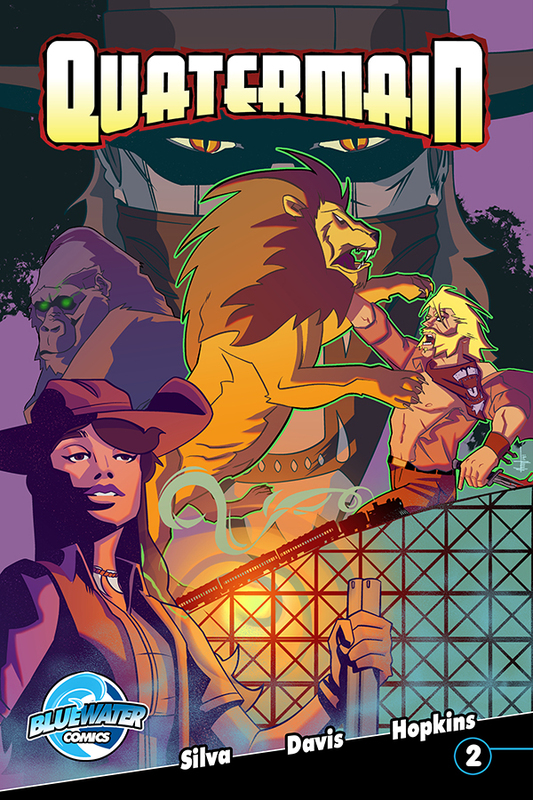 This is a series in the same vein as Danger Girl, and not necessarily even up to the same standards at all times, but still one which is a fun take on the genre and some of the people that it takes a poke at. At the same time, those that do not like Danger Girl or popular culture parodies will probably not find much of interest, especially those that like their comics to be either a bit more mature or a bit darker. Bluewater Productions provided Graphics Policy with a free copy for review. This week, as thousands flock to the city for New York Comic Con at the Javits Center, PETA and comic publisher Bluewater Productions will trot out a provocative comic ad urging the conventioneers to steer clear of the city’s controversial horse-drawn carriage rides. The poster, which will be plastered throughout Midtown this week, portrays a spooked horse colliding with a cab and sending panicked pedestrians flying—similar to the June incident in which a terrified horse broke free from his driver and plowed through Central Park into oncoming traffic. Titled “STOMPED”—in parody of ads for the percussive musical STOMP—the poster features the distraught horse rearing up above a baby carriage as well as a comic book–style graphic that reads, “Carriage Horses Plus Traffic Equals Disaster!! !” This year alone, 13 children and infants were among the 40 people injured in carriage accidents around the country, including high-profile incidents in Manhattan. The poster is designed by Michael Dorman and is the second time PETA and Bluewater have teamed up for an awareness campaign. This fall, Mayor Bill de Blasio will officially announce his long-debated plans to unveil a bill retiring the horses. Tens of thousands of individuals head to San Diego this week for the geekfest that is San Diego Comic-Con. And while much of the show will revolve around fantasy entertainment, that doesn’t mean some real world messaging can’t be included too. As fans de-plane, the first thing that they’ll see won’t be a promo for The Avengers or The Walking Dead but a huge graphic cartoon of a captive orca with SeaWorld‘s CEO in his mouth. The provocative display, which urges convention-goers to steer clear of SeaWorld because of marine-mammal cruelty and confinement, is a joint project between Bluewater Productions and PETA (People for the Ethical Treatment of Animals). The installation cost $24,000, and greets passengers on their way to baggage claim at the center of Terminal 2 at the airport. Bluewater designed the cartoon in the wake of last year’s hit documentary Blackfish. The film—viewed by 21 million on CNN alone—explored SeaWorld’s capture and confinement of orcas, which led the whale named Tilikum to kill three people. The documentary isn’t without controversy, and ever since SeaWorld has been in damage control as attendance has dropped since. Myth, magic and reality start to blur as Quatermain continues his quest to find the body of his son, and faces his greatest foe; his own guilt. But time is running short and Quatermain must track down a powerful shaman that might hold the key to the mysterious were-creatures… or might be there creator. This is Chapter 2: Usiku Viumbe (“Night Creatures”) of new epic adventure serial featuring the original “super” hero-Allan Quatermain. Rock music has taken over the airwaves for decades. Paul McCartney, John Lennon, Keith Richards, Jimi Hendix, Bob Dylan, Jim Morrison are just some of the iconic figures that have formed the rock music genre. This jam session of biographies showcases these trailblazers in this unique illustrated graphic novel. 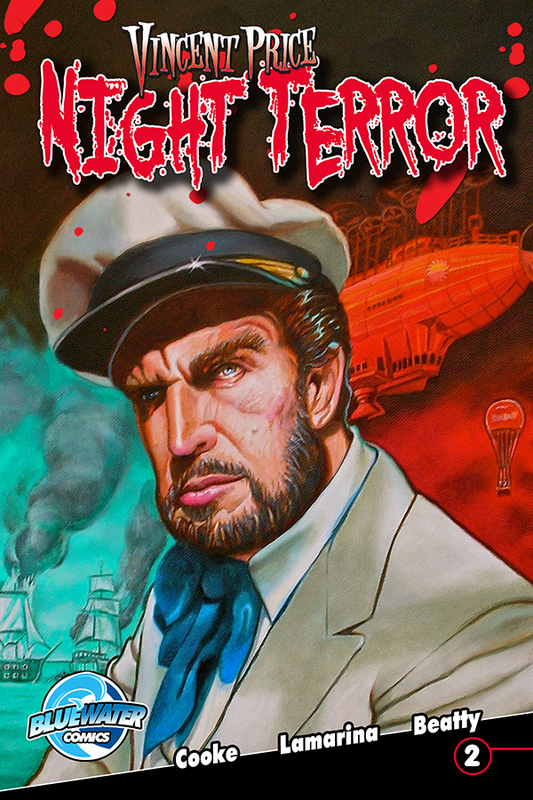 The epic anothology series continues with a new story featuring the master of horror Vincent Price. Leave the lights on when reading this….you have been warned and enjoy “Behind Blue Eyes”. In the 2008 US Presidential election, Sarah Palin became a household name. 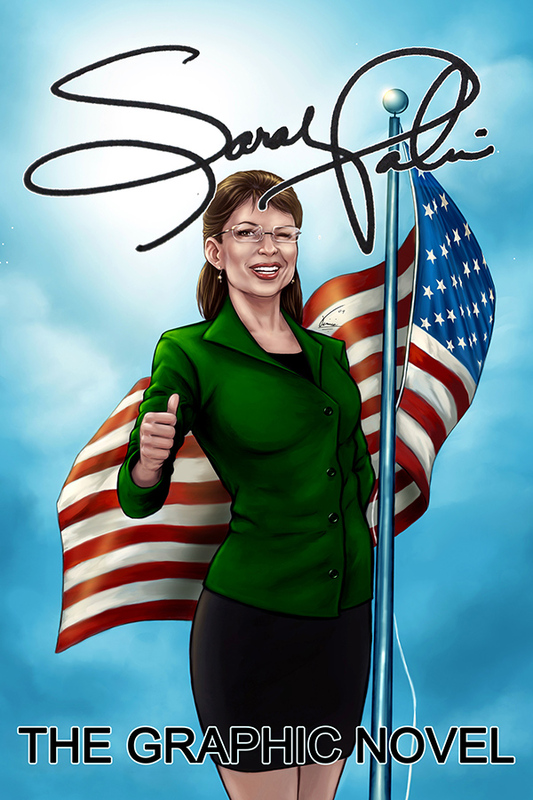 In this graphic illustrated biography Bluewater presents a critical examination of the life and times of Palin. From her upbringing in Alaska to being an activist best selling author this graphic novel features her struggles as well as her achievements. Combining for the first time the sold out comic series “Female Force” featuring Sarah Palin. May the odds be ever in Jennifer Lawrence’s favor. Bluewater Productions popular line of biography comic books continues with The Fame: Jennifer Join writer Michael Troy and artist Ben Eargle for an exploration of Jennifer’s career from starring in successful X-men and Hunger Games franchises to winning a best actress Oscar for her celebrated role in Silver Lining’s Playbook.